Oh, What Do We Know? Elwood wrote this title song last summer, thinking back on how well he understood his kids' lives while they were young and growing, compared to how little he knows about their daily lives now that they're adults. Of course, he deludes himself if he really thinks they let him in on all that they were up to, even back then. In the early 90's, we were both working day jobs while pursuing our music career and bringing up the kids. We were so busy during those years that any small interruption or change in schedule could've thrown us off for days! Originally recorded in 1997, Elwood wrote this song of hope for all of us who have, at a time, felt downtrodden and defeated. We've added violin and tambourine for this version. Originally recorded in 1992, this song was inspired by Aubrey's grandmother, Mary Eaton His, who was a brilliant violinist. Once, when Aubrey was a teenager, her grandmother looked at her solemnly and announced, "Aubrey, music is my lover." Later, Aubrey would understand what she meant. The irony here with this syncopated and improvisational style, is that she very much disliked jazz, declaring it caused a "frenzy in the brain." Sorry, Granny! We've added violin, piano, bass and percussion to this version. Elwood wrote this song two years ago, before he finally realized that although he's not responsible for the mental health of others, he is also not impervious to the hurt of accusations and abuse. Originally recorded in 1997, Aubrey wrote this lullaby for parents everywhere who have learned that moments of utter peace of mind are sometimes few and far between. Elwood wrote this song after a funny conversation with Aubrey one evening when she turned to him and said, "If you ever leave me, I'm going with you." What we don't have yet will surely turn up soon. Originally recorded in 2004, this song was inspired by a weaver friend. But the song is also autobiographical, speaking to women artists who sometimes live on the edge, wanting to pursue their passions while also doing right by their families…sometimes a precarious balance. Here we've added tin whistle, cello and percussion. This song was originally recorded on tape while Aubrey was a student at Brown University. It was written in her very young days, before she met Elwood, and the theme reflects her introverted side. We've added Elwood's vocals and Kevin on shaker. Originally recorded in 2004 as a testimony to love and why we should pursue it rather than avoid it, even when heartache is inevitable. Here we've added bass and autoharp. Is waiting until then worth waiting for? 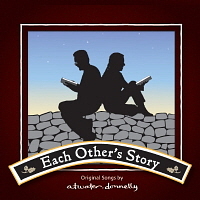 Originally recorded in 1992, Aubrey wrote this song at age 19, as a final project for a French class in college. The story was inspired by a homeless woman who Aubrey saw frequently in her former neighborhood in Philadelphia. We've added accordion and percussion for this version. Please, did you listen to my song? Originally recorded in 1997, this song is about how Elwood's mother seemed trapped in a relationship with his father, always attempting to circumvent his anger and mood. Their relationship helped teach Elwood to be forgiving. We've added violin, bass, percussion and more vocals for this updated version. You're standing within while he wanders without. Originally recorded in 1997, this song was inspired by Aubrey's family's history of owning and operating coal mines in the early 1900s. The Atwater Coal Company transported coal from Bluefield, West Virginia to the Fall River knitting mills in Massachusetts. This song took Aubrey months to write because she wanted to deal with controversial issues in a way that was respectful to her family, especially her father who was always so generous with sharing family history. Well on a good day, you can see very far, just drive up high and get out of your car. And on a good day, you can see very far, just drive up high and get out of your car. Originally recorded in 1992, this song was inspired by Aubrey's dear grandmother, Eleanor Bartlett Atwater (1897-1990). When she was in her 90's, she said to Aubrey, "It's hard when all your friends are gone." I sang this song for her once, and her reaction was, "How lugubrious!" We've added only chimes here. Originally recorded in 1994 and written in the key of D, Elwood decided to bring it up a step and a half, add piano, bass and more vocals. This song was written as a reminder that, change, be it personal or social, begins with ourselves. Originally recorded in 1992, Aubrey wrote this politically-tinged song mid-winter when many people are weary of the snow that has turned dirty and frozen. She was working in the poorer neighborhoods of Providence where she was struck with how especially hard the winter is on the disadvantaged… noticing also, that their streets were often plowed later than the more well-off parts of the city. Here we've added harmonica, bells, cello and doumbek. Originally recorded in 1994, this is the only purposeful duet Elwood has ever written, where the two vocals counter each other from both the physical and spiritual domains. It is a song of longing and hope for rejoining dearly loved ones in the hereafter while attaining peaceful acceptance here on earth until that day. We've added violin and bass here. Originally recorded in 1992, this song was written after Aubrey saw a fox dart across the road in front of her car, triggering thoughts about what is wild all around us. We've added jaw harp and bodhran for this version. Originally recorded in 2004. Although this song was inspired by the events of 9/11/01, Aubrey made the meaning broad enough to apply to the healing involved with any trauma or major life event. We added violin for this version. When a week had passed, he said, "You must get dressed. "The best thing we can do, is go on with our work." He said, "The harvest won't wait and there's still beauty everywhere." Elwood wrote this song in 1966 while he was in a garage band in Providence. The band, The Lonely Things, made one recording, with this song on the A side. Two years ago, Elwood's son found this song, by means of much computer research, on a compilation CD called New England Teen Scene – Unreleased!, 30 Killer Garage Rock Winners From 1965-1968. Click here for more information about The Lonely Things. Even though Elwood wrote this song, he can't remember some of the lyrics, so if anyone can figure them out, please forward to him.